Happy Thanksgiving a tutti! Susan and Gary again hosted a bunch of folks for the Thanksgiving feast. You can take a look at last years feast in the Archives. 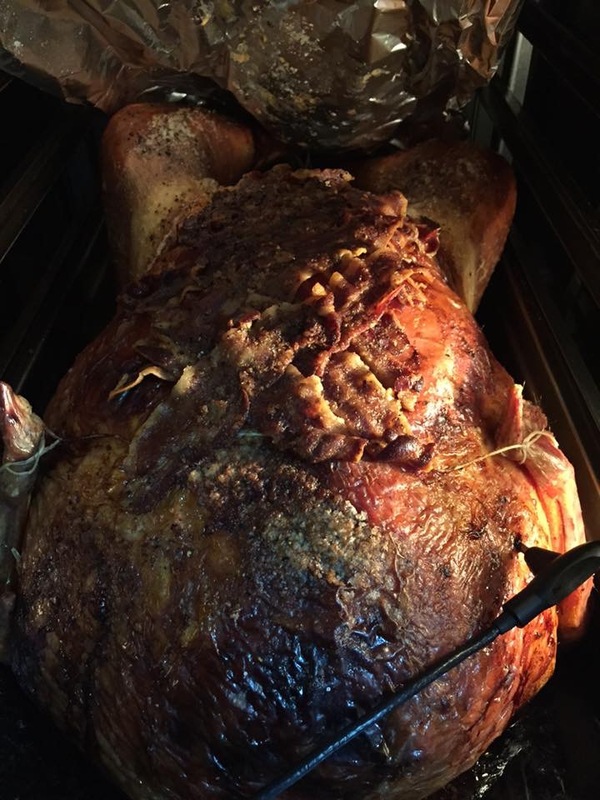 We again had Calagrana Agriturismo make our turkey and all the antipasti. The turkey wasn’t as big as last year. “Only” 28 pounds. Beautifully cooked. I brought the mashed potatoes and cranberry sauce. Joseph and Paul brought two pies, Susan made a pie and Jim and Denise brought a tart. The attendees were eight Americans and six Italians. Some of the Italians came last year. One named Fabio, brought his parents this time. A fine time was had by all. We were, as stuffed as the turkey. Fabio lamented that there was only ONE Thanksgiving a year! He is a real fan. Susan’s table. Photo by Susan. Pictures from Calagrana of the bird in progress. Photos by Ely. 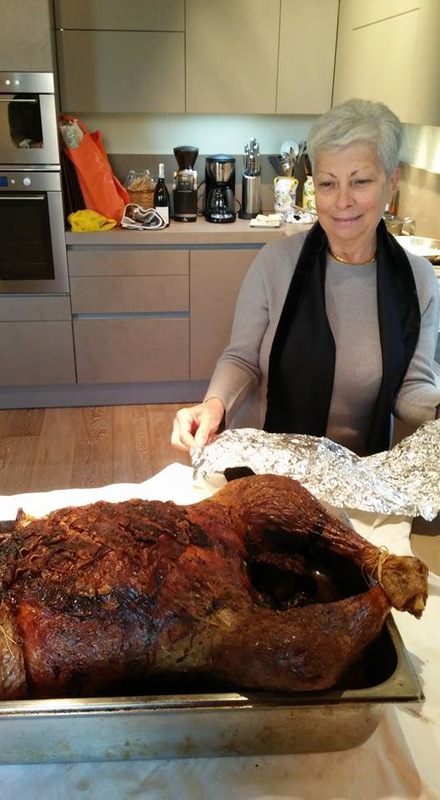 Fabio’s mom with the finished product. Photo by Fabio. On actual Thanksgiving we went shopping in Colestrada at the Ipercoop. It was pretty quiet. We noticed signs everywhere advertising Black Friday. Thank you America! It is kind of odd because they don’t have the Thanksgiving holiday to make the Friday date significant like we do. All the European Amazons had huge sales too. On Friday we got our town Christmas tree. It is much smaller this year. 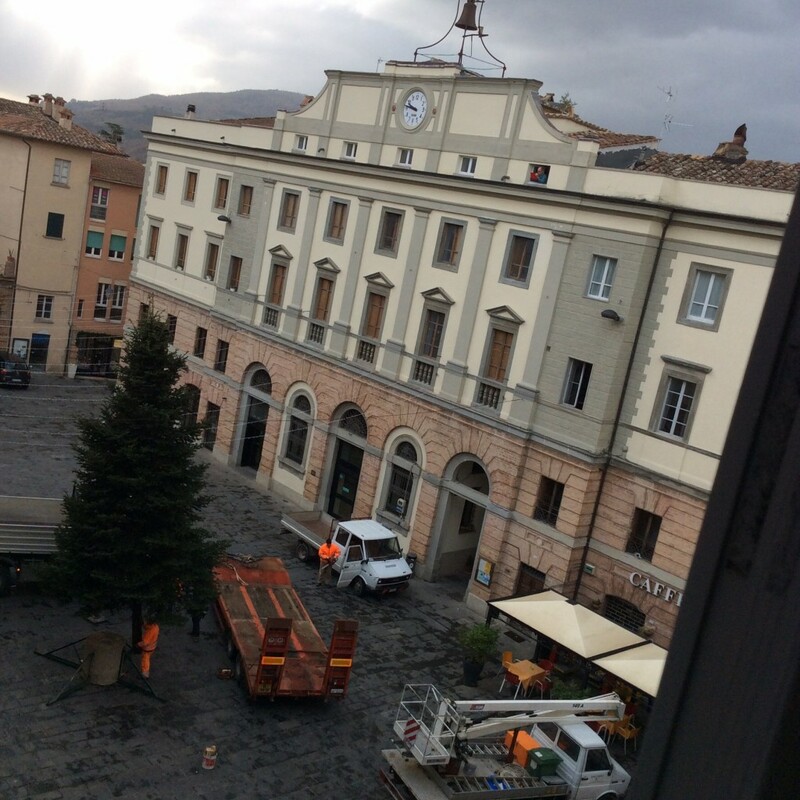 There was speculation among the Americans that it was small because the town had bought a bunch of lights to string above the piazza, spending their tree budget perhaps? It is a pretty tree though. Not sure when they will decorate and light it. This entry was posted in cooking, Eating, everyday life in Umbria, Uncategorized on November 29, 2015 by Nancy Hampton. During the night we had strong winds and rain. It was a cold front which finally chased our beautiful weather away. Oh well, had to happen sometime. 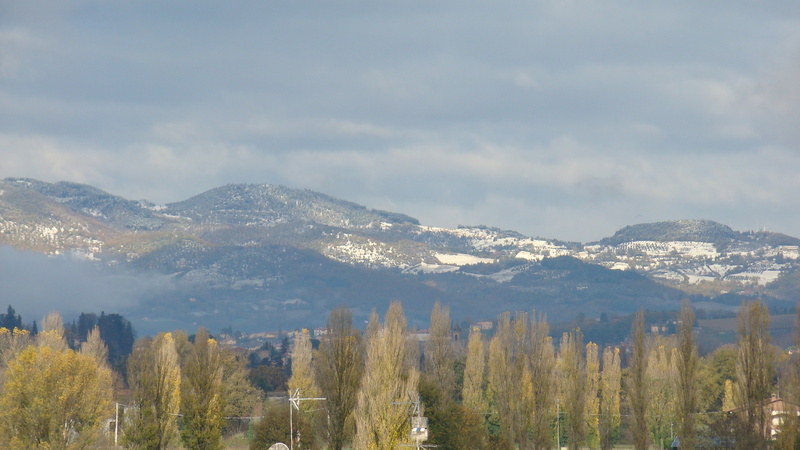 BUT I was surprised to notice to our northwest … was that snow on top of the mountains?! The mountains are a little taller than our nearby ones up there so I guess it was just high enough that the rain fell as snow. 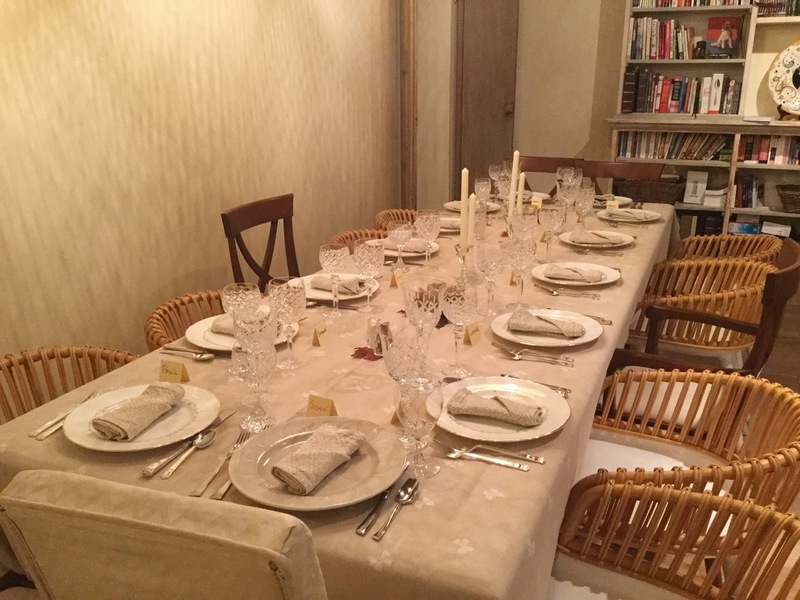 This is Thanksgiving week back home and we are again invited to the feast at Susan and Gary’s house. We decided to move it to Saturday for the convenience of the Italians who are invited. So far it is: Susan and Gary, me and Luther, Denise and Jim (visitors from the US), Simona and Simone, Fabio and Fabio’s parents from Milano. Simona, Simone and Fabio were there last year and enjoyed it. Fabio’s parents don’t speak English so Susan is seating Luther next to them so they can talk. I am making the cranberry sauce again. Denise and Jim brought the fruit with them. Yay! 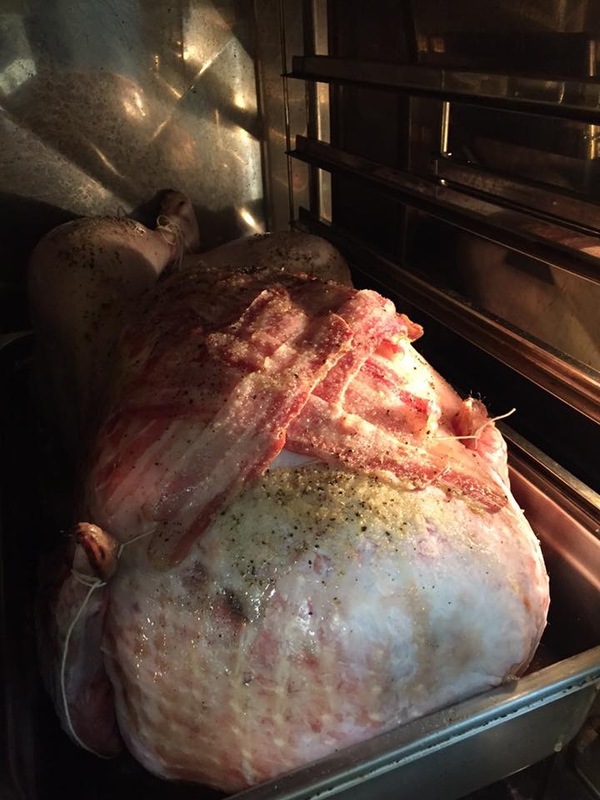 Ely is again cooking our turkey. Should be a nice celebration and I am looking forward to it. Missing my sister though. It is such a family holiday to me. But I’ll be seeing her soon so that takes some of the sting out. The Umbertidese are gearing up for Natale or Christmas season. They have strung small lights across the piazza and up and down the little streets. I looked at my blog from last year and see they brought the tree November 22nd so we should be seeing that soon. 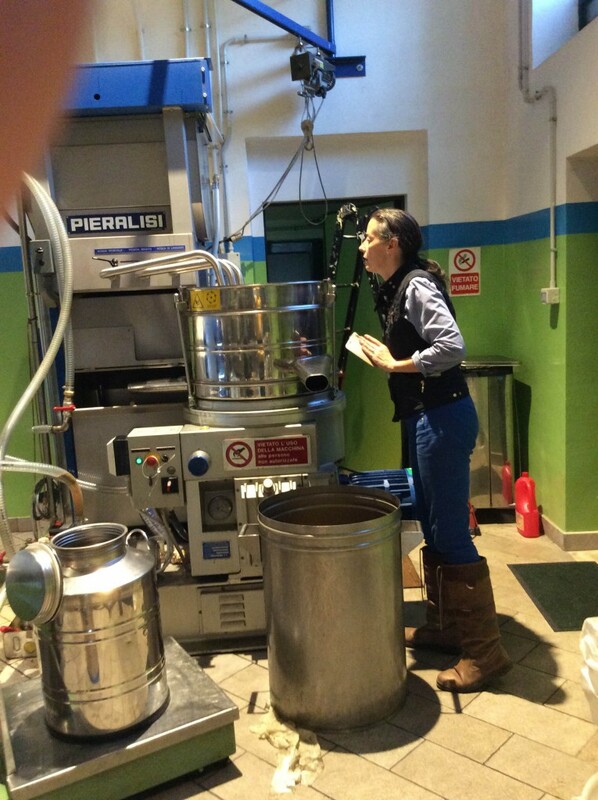 This entry was posted in cooking, Eating, everyday life in Umbria, Uncategorized on November 22, 2015 by Nancy Hampton. What a day! We started out early to Calagrana to begin picking at 9AM. Ely had an appointment at the mill for between 2:00 and 2:30. There were seven trees left to pick. The crew was: us, Ely, Ely’s friend Catarina, one other woman and the gardener. We picked non-stop until around 1:00 when we were pretty well finished. 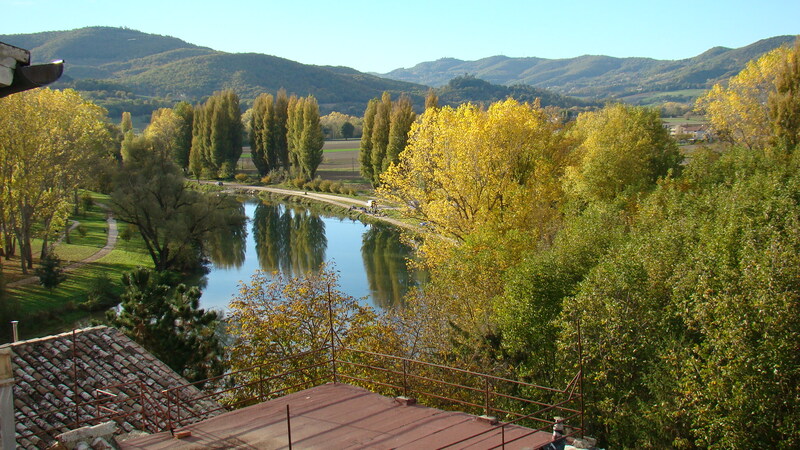 We left Ely to load up two vans with the boxes of olives and we were to meet her and follow them down to the oil mill in Pierantonio, the next town down from Umbertide. The mill was a busy place! It being all new to me I was fascinated. Ely and Catarina drove the vans onto the scale. They weighed them and then we unloaded the olives. Then they moved the vans back onto the scale to be weighed empty. 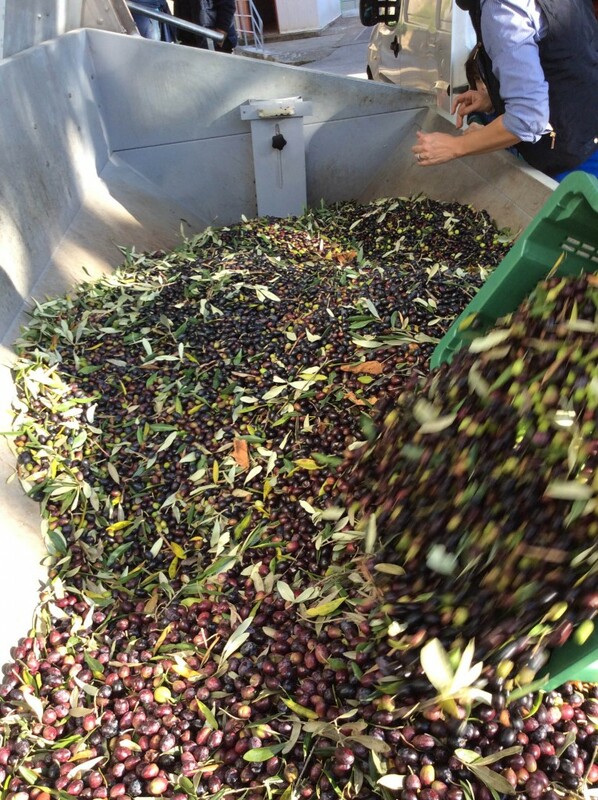 Turns out we picked 700 kilos of olives! 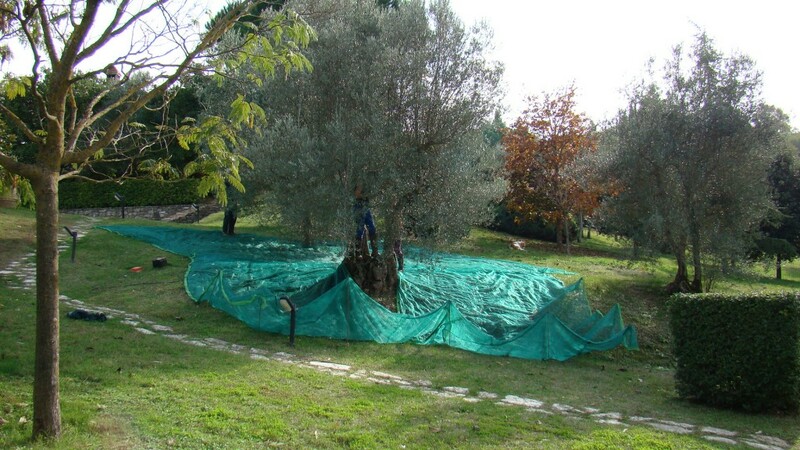 Next they load the olives into a giant vat and the olives are sucked down from the bottom where they climb a sort of ladder and blowers blast the leaves and stems away. Next they go into the washer and up a ramp and into the hoppers. There were essentially five hoppers so they could process five people’s olives at once, each in turn being finished into oil. 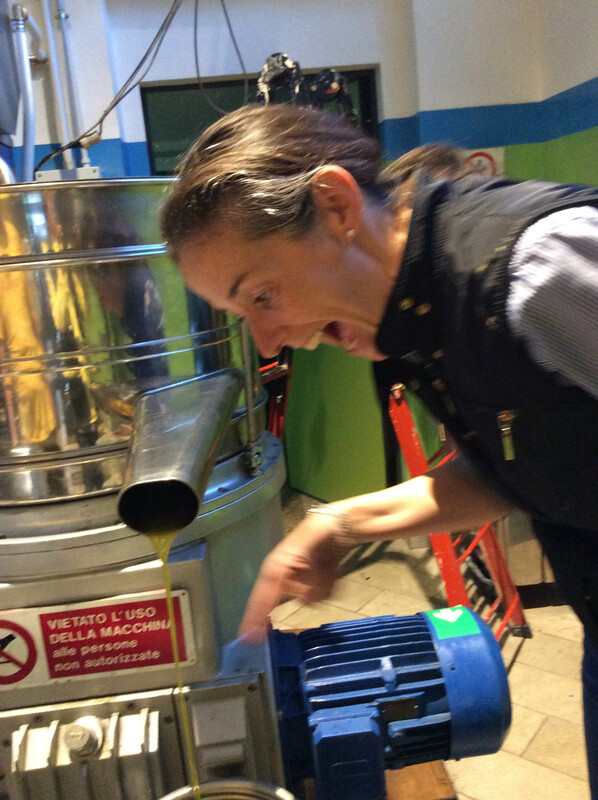 In the hopper there were big, round blades that blended the olive paste for 45 minutes. 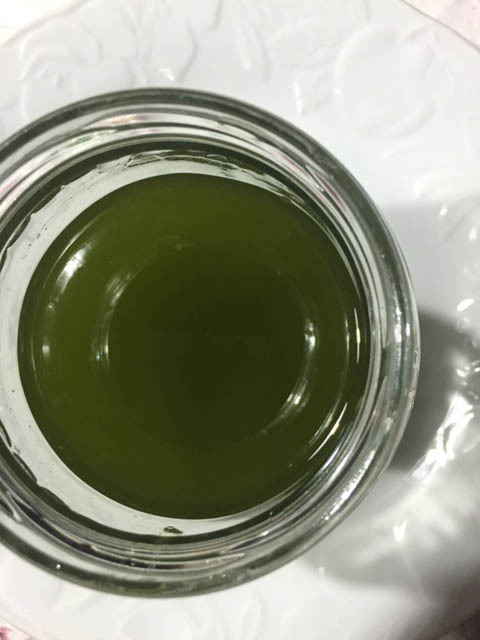 While this was going on as each other hopper was ready they turned a handle and the paste drained out, under the floor, and was separated into the glop, the oil and the water. The oil then trickles out, through a filter and then into the containers. It was fun watching the other people as they waited for their oil. Everyone was happy and smiling at everyone else. The olive harvest is a happy time! The work is done. The trees have done their work as have the harvesters. Happy customers carried heavy containers of oil to their vehicles. There was an amusing group of 5 “boys” (all looked to be in their 60s or 70s). They had a shared grove and they worked together to harvest it. Then they had to divide it up. It was amusing to see them watching that scale like hawks to be sure no one got more than anyone else! 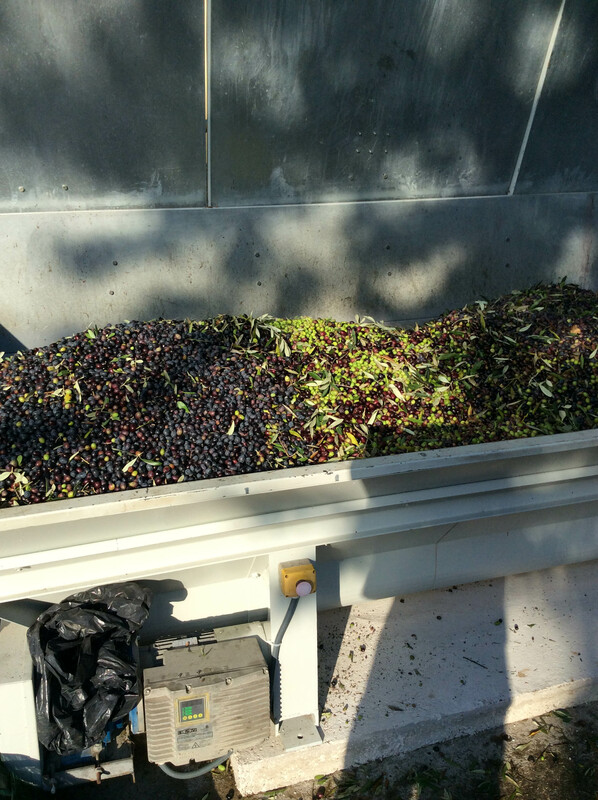 The final numbers for Ely’s harvest were…700 kilos of olives, pressed into 88 liters of oil or about 12%. 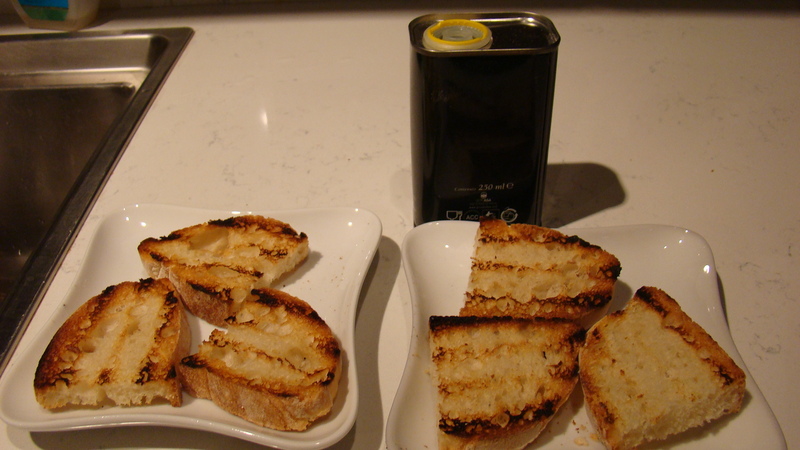 So 12% of the olives were oil and the rest – skins, pits and water. Ely was happy but not ecstatic. It was a good-ish year. 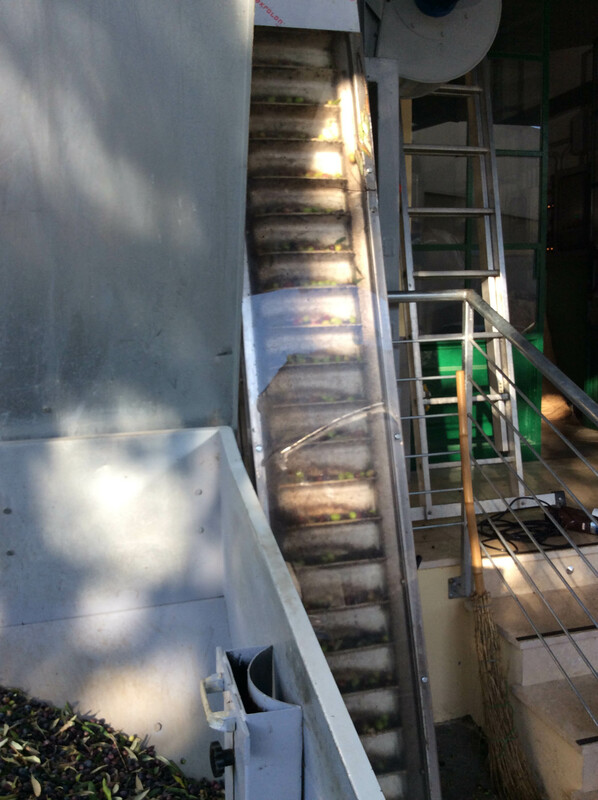 Here is the off-loading of the fruit from the vans into the big vat. 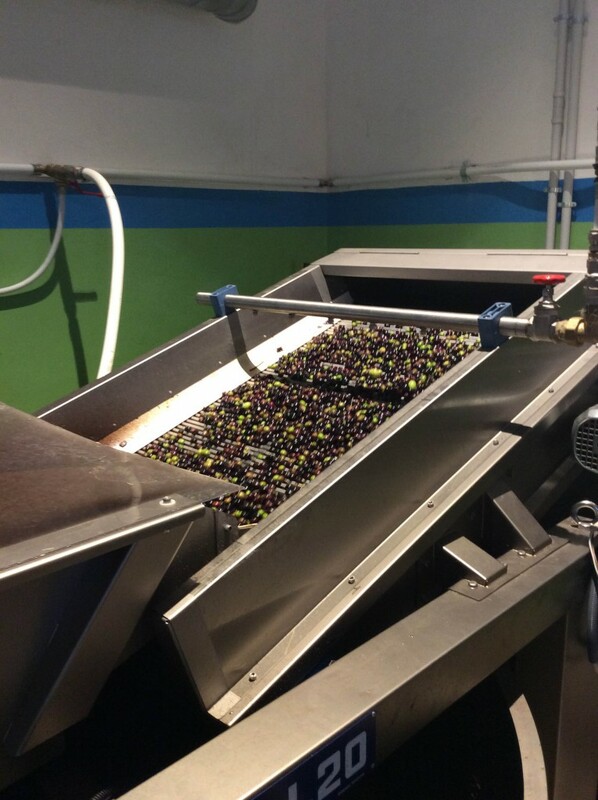 The vat filled up with “our” olives. The ladder where the leaves are blown off. 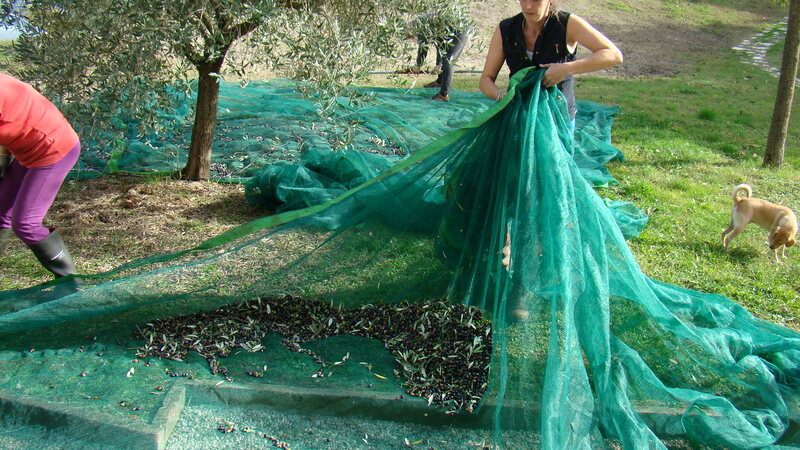 The washed, de-leafed and de-stemmed olives. 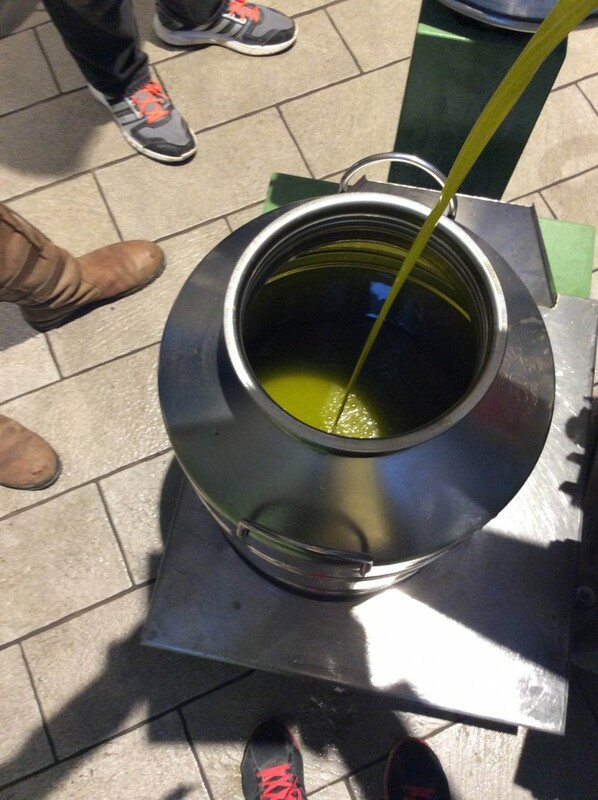 The hopper full of our olive paste. This was after about 45 minutes. 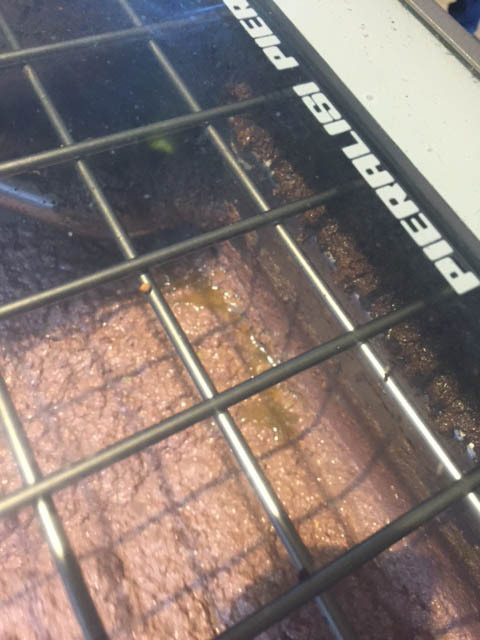 You can see the pooled up oil on the right of the container. 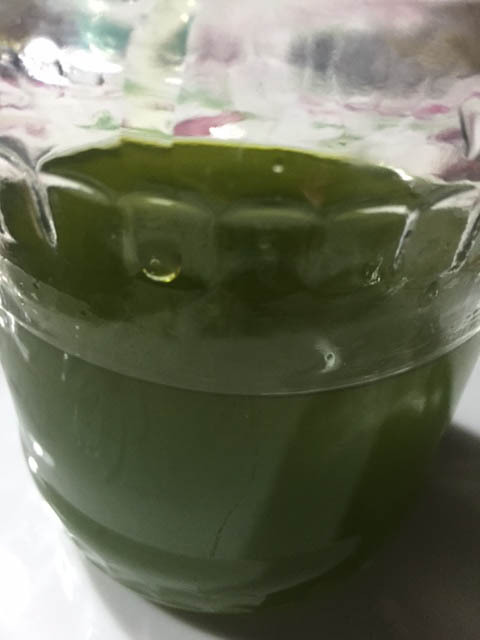 Finally, after Ely got home she drained a little into a glass jar for me. 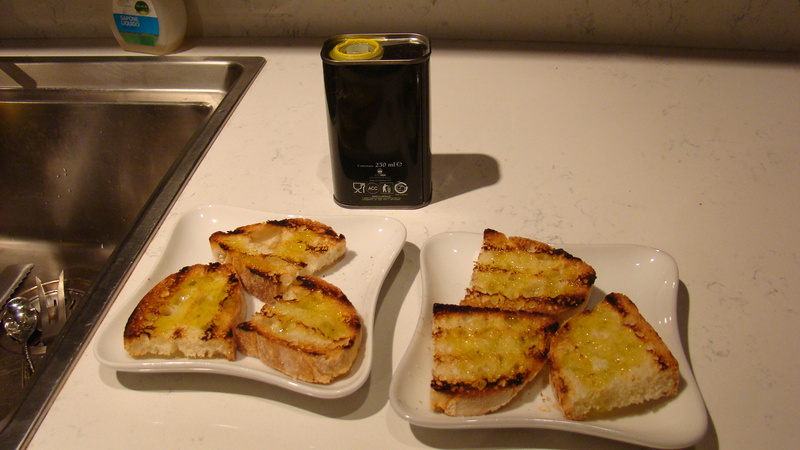 I will pick that up tomorrow and we will have some bruschetta. I’ll report on that next. This entry was posted in Eating, everyday life in Umbria, Umbria, Uncategorized on November 6, 2015 by Nancy Hampton. 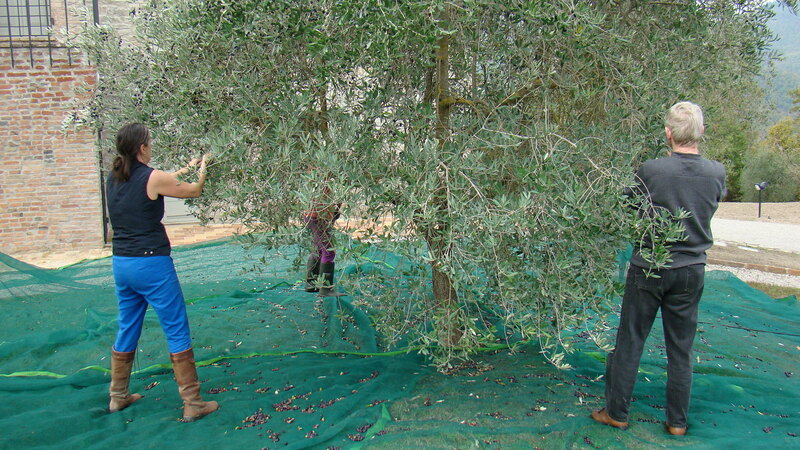 I was so excited to find out our friend who owns Calagrana was harvesting her olives and needed help. I had a couple of reservations as to whether I could hold up to the physical effort (not as young as I used to be!) but thought the opportunity was too good to pass up. We didn’t leave Umbertide until around 11AM so they had been working a couple of hours. The olive grove is way up on top of the mountain spread out around a lovely casale (big farm house) owned by Ely’s English friend. Ely and Alberto tend to the trees and manage the harvest and production and share some of the oil with her. A win-win situation. She had a neighbor helping her plus a couple of other pickers and the gardeners of the grounds. Her neighbor had brought what Ely called a basher. It had long tines which vibrated in different directions. 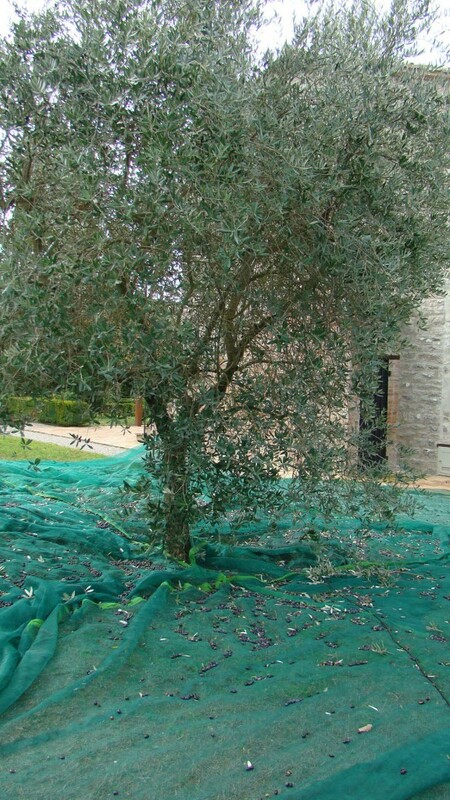 You lifted it up into the tree to get at the high branches and it shook the olives down. You place the metal stakes at the downhill side to catch the rolling olives. 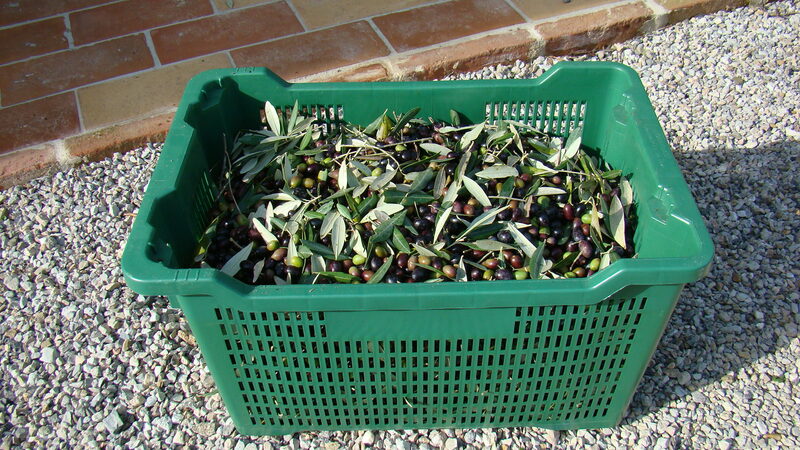 Bin full of olives. The leaves need to be mostly removed from the box. 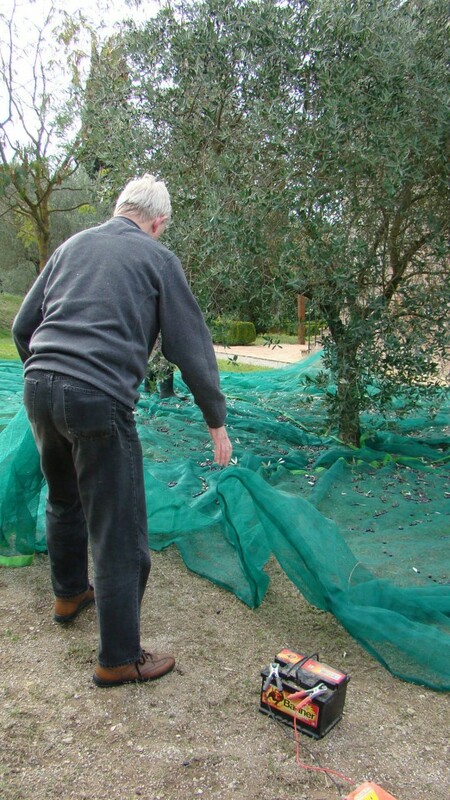 After you knock them all off the nets are gathered and the olives are rolled into one spot, then dumped into the crates. 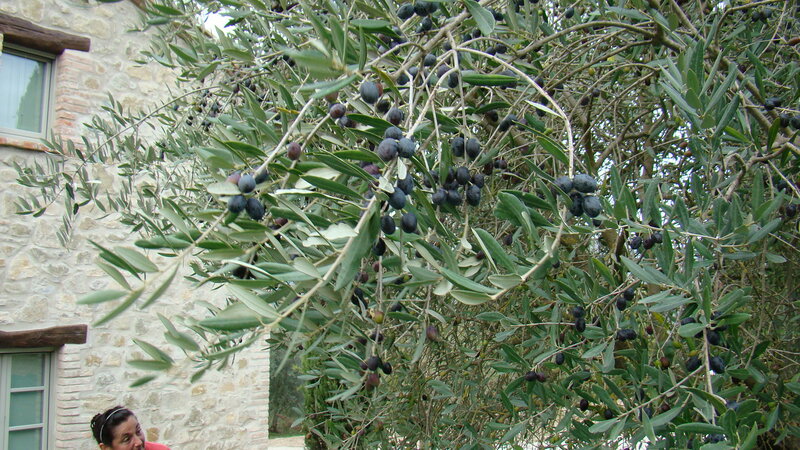 Olives ready to be harvested. Ely and Luther hand picking while Catarina works the “basher” on the opposite side. 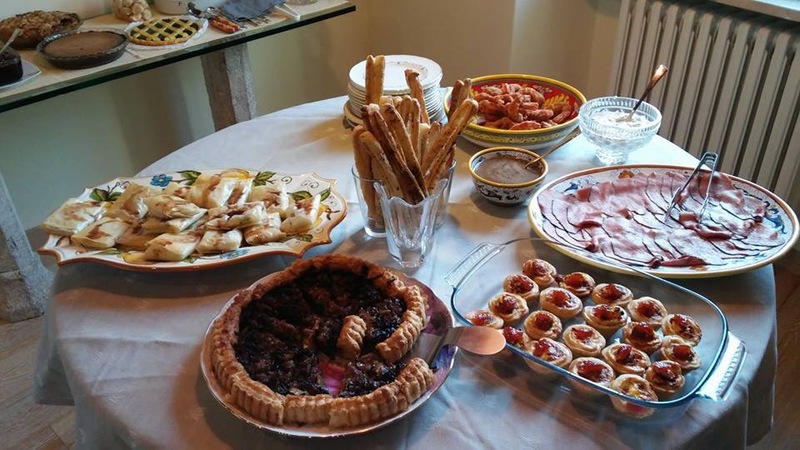 This entry was posted in cooking, Eating, everyday life in Umbria, Umbria on November 4, 2015 by Nancy Hampton.